Succulent dark green leaves with eye-catching white stems. Think spinach, but sweeter and more robust. 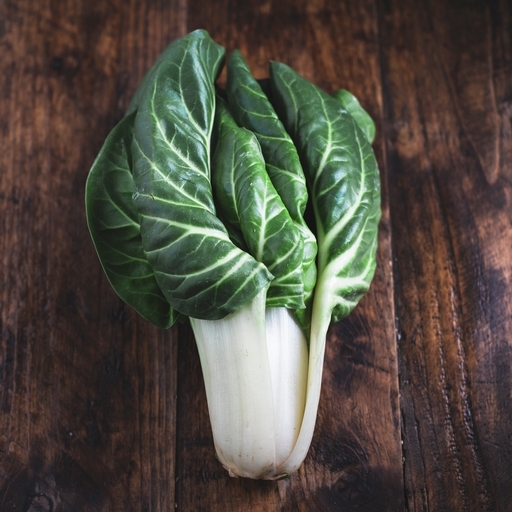 Swiss chard is full of earthy flavour, and holds its texture well when cooked. The stalks can be eaten too, and have a wonderful juicy crunch – they’ll just need longer to cook than the leaves. Strip the leaves from the stalks and cook them separately. The leaves can used anywhere you would use spinach. Good wilted into soups, curries or risottos. The stalks need slightly longer boiling or braising and are wonderful vehicles for strong, fragrant sauces. Or combine the quick-blanched leaves and cooked stems in a cheesy gratin or as a filling for a summery tart.